With close to 6,000 certified professionals worldwide, CTP is the largest vendor-neutral convergence certification program and is recognized as the official convergence program of the Telecommunications Industry Association (TIA). Supporting this effort is the CTP Certification Advisory Council, consisting of leading manufacturers and professionals in the telecommunications industry. Through the council, companies such as Avaya, Inter-Tel and Toshiba help define the CTP objectives, and maintain the integrity and relevancy of the CTP certification. CTP is endorsed as a "stepping stone" to Cisco IP Telephony certification. CTP is accepted by Toshiba as fulfilling the convergent technology prerequisite for certification on IP products. CTP is recognized by NEC America, Inc., as an integral part of prerequisite training for all individuals involved in Voice over IP (VoIP) deployment as well as the computer telephony interfaces of NEC state-of-the-art telecommunication systems. CTP is the recommended credential for all Iwatsu authorized resellers, as well as Iwatsu engineers, sales, marketing and support professionals. The demand for unified communications solutions that are feature-rich and cost-effective continues to grow at a rapid pace. Selling, installing and maintaining these solutions requires a well-trained workforce that understands how the technologies integrate and how to best meet customers' needs. The CTP (Convergence Technologies Professional) training and certification program provides this vital knowledge foundation. CTP certification helps build a more efficient convergence workforce, improve customer satisfaction and enhance competitive position. CTP training helps you become a knowledge expert and build applicable skills for high-demand sales and engineering careers in the convergence industry. Need an entry level introduction to convergence technologies? Try the CCNT (Certified in Convergent Network Technologies) certification. Click here to view information on CCNT certification. Designed and endorsed by industry leaders - As the official convergence certification program of the Telecommunications Industry Association (TIA), the CTP certification represents the development efforts of leading industry manufacturers worldwide, including Avaya, Inter-Tel and Toshiba. These industry leaders understand the critical need for a broad-based certification to serve as a foundation for their vendor-specific learning programs. Vendor-neutral and standards-based - As customer needs and technology advancements continue to evolve, a proven standards-based learning approach is needed to ensure that personnel have a comprehensive view of the methods, concepts and best practices of a single converged network. 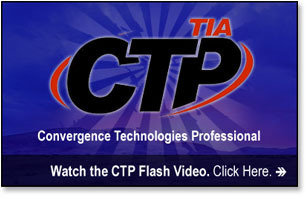 The CTP certification exam validates core knowledge of convergence industry standards and protocols. It is earned by passing a high-stakes, computer-based proctored exam consisting of 65 multiple choice questions. The CTP certification differs from the CCNT (Certified in Convergent Network Technologies) certification, which is an un-proctored, open-book program that serves as an entry-level introduction to convergence technologies. It is recommended that an individual has attained the knowledge level of CCNT before preparing for the CTP exam or have a minimum of 18-24 months of experience in all three subject areas to take and pass the CTP exam. The CTP certification is the only proven program designed to validate standards-based knowledge in today's convergence technologies. With more than 4,000 CTP-certified individuals worldwide, the CTP certification continues to lead the way in workforce readiness and industry-approved learning development. The CTP certification is supported by a high-stakes (proctored) exam that validates that an individual has the core knowledge and skills required by equipment manufacturers, their channel partners and end-users to sell and service convergence technologies. The CTP certification represents the development efforts of leading industry manufacturers worldwide, including Avaya, Inter-Tel and Toshiba.